Smoked salmon has become a bit of a staple in our house. Aside from being one of my favorite brunch foods (eaten on a toasted Montreal bagel with cream cheese, lemon & capers, of course) it’s a great ingredient to keep on hand in your freezer for a really quick weeknight meal. We usually default to this quickly assembled dinner, but last week we thought we’d try something a little different but equally fast and simple. 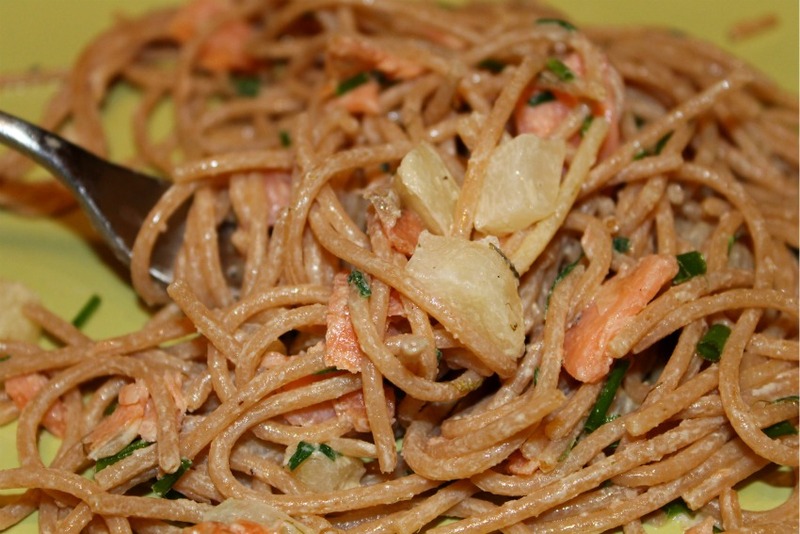 We made this pasta up as we went along, grabbing a handful of ingredients that felt like obvious companions to the smoked salmon. The soft, salty/smoky salmon worked so nicely with the slight tang of the Dijon, the sweetness of the caramelized fennel and shallot, and the fresh hint of onion from the chives. The nuttiness of the whole wheat pasta really made a difference, too. I usually squirm when Neil suggests adding cream to a dish we cook at home, since I’ve been conditioned to think that cream sauces are evil and will go directly to my thighs without being ‘worth it’. But as Neil pointed out, a little goes a long way in this pasta. 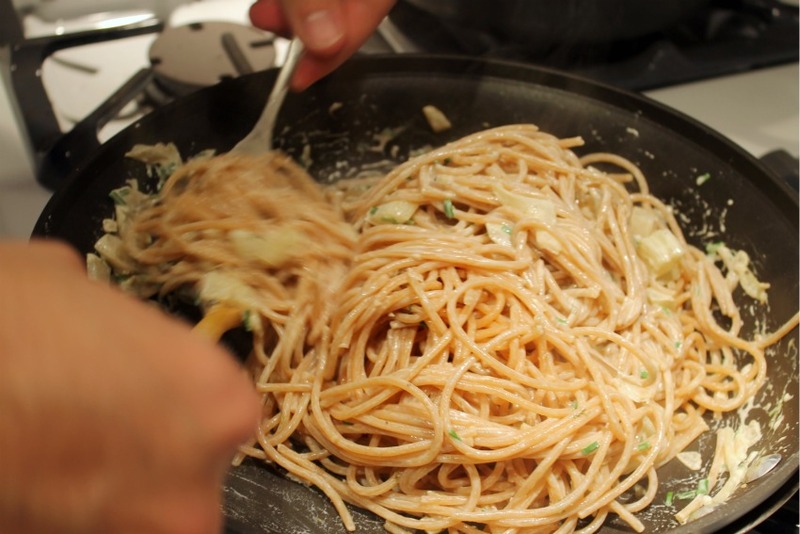 You don’t need to create a full-on sauce, dousing the pasta in cream. Just use enough to lightly coat the bottom of the pan, and you won’t be riddled with the kind of guilt that the likes of fettuccini alfredo inevitably leave behind. Heat olive oil in a large pan on medium heat. 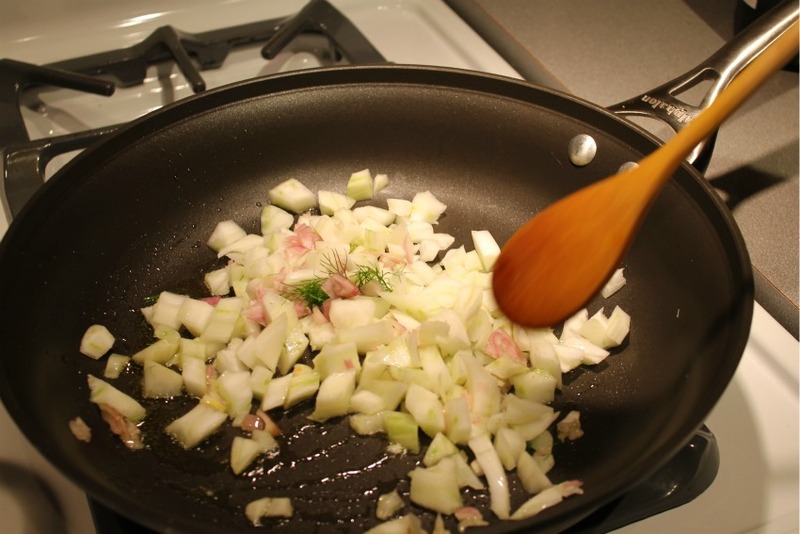 Sauté fennel and shallot until they’re soft and caramelized. Season with salt and pepper. Add some white wine and cook for another few minutes. 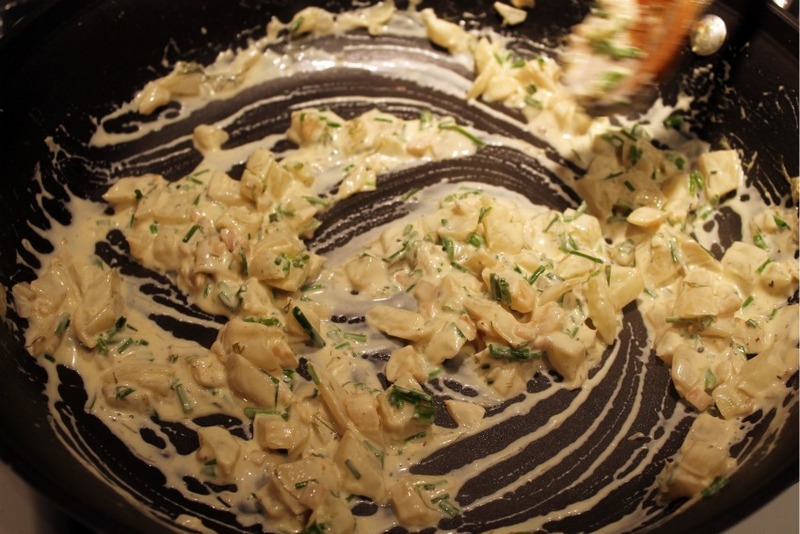 Mix in the Dijon mustard and half of your chopped chives, keeping the rest to garnish. Reduce the heat to low, add in the cream and mix. To be honest, we eyeballed the cream (with me on the sidelines reminding Neil not to add too much!) but probably ended up with just about a half a cup. Enough to coat the pasta but the goal is not to create a full-blown sauce. Make sure you’re heat is down on low so the cream doesn’t curdle. Add in your cooked pasta while it’s still warm. Toss in the pan to coat the pasta evenly with the sauce. 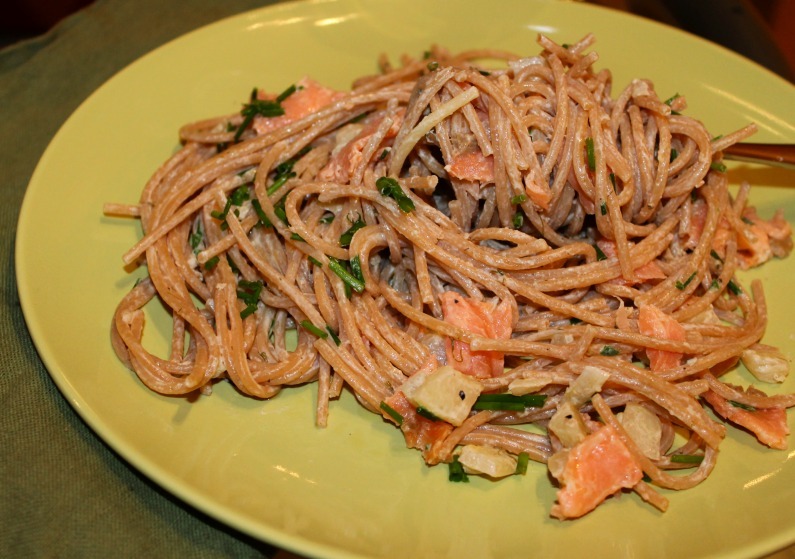 Add in the smoked salmon at the last minute – you don’t want to cook it but you want to incorporate it. Serve sprinkled with the rest of the chives. We drizzled our plates with some lemon-infused olive oil, but a little squeeze of fresh lemon juice would be perfect too.